The mindset never changed, nor did the attitude to stick to a full-embodied game plan. The Kings’ poise to stay simple, basic, and true to themselves as a group on a consistent basis through trials and tribulations is what carried this roster out of troubling times in order to complete this magical turnaround. Their uncanny mental strength can be a definite nod to Darryl Sutter. Their immunity from panic is what kept the Kings alive throughout this series, and that’s what brought them their 5-1 series-clinching victory Wednesday evening at SAP Center. It was a balanced performance throughout; the Kings played a tight-knit game, not stretching apart like they did in the early stages of the series, making sure there was a core to each play and possession, providing support and protecting the puck away from danger. Some of the more impressive play from the Kings Wednesday came in their defensive zone, keeping San Jose’s power play scoreless in six opportunities, blocking 23 shots, and holding strong in front and around of Jonathan Quick, who put in a stellar performance of his own, stopping 39 of the Sharks’ 40 shots. After a scoreless first period which had an overtime feel to start as both clubs got the feel for each other in playing a rather conservative opening 20 minutes, San Jose struck in the opening seconds of the middle frame. The Kings collapsed in the defensive zone, and Tomas Hertl found Matt Irwin high atop the point, who ripped a snap shot through traffic, beating Jonathan Quick low to the glove side on a shot the Kings’ goaltender couldn’t eyeball. Irwin’s goal gave San Jose a 1-0 lead :28 seconds into the second period. After evading more trouble following Irwin’s goal by killing off a Slava Voynov penalty, the Kings flipped the switch and went on the power play themselves as San Jose was called for two consecutive minor infractions. As the Kings pressured the Sharks, who were in the midst of returning one of their players from the penalty box, Marian Gaborik lasered a shot wide that caromed off the back-boards which Drew Doughty pounced on, and in one motion off his back foot, Doughty lasered a wrister high and over a Antti Niemi who was caught in transition. Doughty’s goal, his first of the playoffs, knotted the score 1-1 with 15:03 to play in the second period. The Kings found themselves in more penalty trouble after Doughty’s equalizer as they were called for three consecutive minor infractions. The Kings’ penalty kill though, along with Quick, stymied the Sharks, including a magnificent glove save from Quick on a golden opportunity from Patrick Marleau midway through the period. In the final moments of the second period, Kyle Clifford recovered the puck in the neutral zone and fed a pass to Justin Williams who was shooting down the right side. Williams, with plenty of room and speed, took the puck wide deep into the corner, then fed a trailing Anze Kopitar with a picture-perfect pass directly in front of Niemi. Kopitar used Niemi’s momentum on the pass against him, and with a quick shimmy of the shoulders after receiving Williams’ pass, pocketed home the Kings’ second goal of the night high and to the left corner with the chip of a backhand. 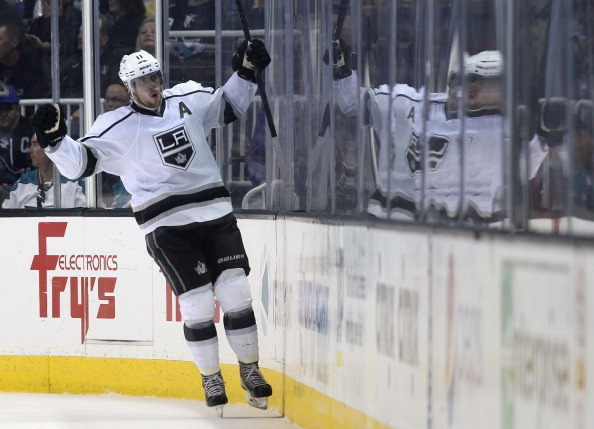 Kopitar’s tally gave the Kings a 2-1 lead with just 1:21 to play in the second period. The Kings would carry that lead with them into the second intermission, and get insurance from Tyler Toffoli less than five minutes into the third. After chipping a puck ahead to Tanner Pearson as the Kings entered San Jose’s zone, Toffoli raced to the net as Pearson settled the puck down in the corner. Pearson found Toffoli, completing a little give-and-go dandy, and Toffoli in an instant, beat Antti Niemi high to the left corner, giving the Kings a 3-1 lead with 15:20 remaining in regulation. It was Toffoli’s third goal of the series. San Jose, in desperation mode, couldn’t capitalize on a late penalty called on Jake Muzzin, the Kings’ successfully killing off the Sharks’ sixth and final power play of the night. The Kings then turned to San Jose’s empty net. Dustin Brown gave the Kings a 4-1 lead with 2:07 to play, and Tanner Pearson topped it off, giving the Kings a 5-1 lead with :47.3 remaining on the game clock. Jonathan Quick, who struggled mightily to start this series, was arguably the best performer Wednesday night, making 39 saves on San Jose’s 40 shots. With the series win, the Kings have become only 4th NHL team to overcome and win a playoff series after trailing 0-3. The Kings will face the Anaheim Ducks in the Western Conference Semifinals, which will likely begin this weekend at Honda Center in Orange County.